This is one of the greatest recipes, I have made thus far in the air fryer, they might be better than chicken wings. (And those are amazing). They were so good, my youngest son, asked me if I grilled them because they were amazing. These were fall off the bone tender, and they had all of the sauce, which made them gooey and just pure heaven to eat. Ribs are one of my kid’s favorite dinners to eat, whether take out or just at home. These are good enough to be served a restaurant, but easy enough for you to make a home. And once you get the hang of them, you will keep on making them, because they are that good and easy. 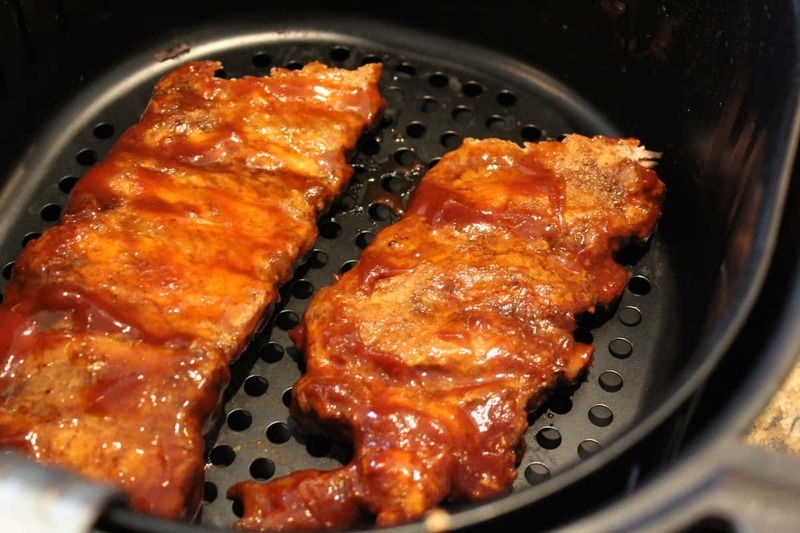 There are several awesome things about making ribs in your air fryer. They are almost mess-free, after all, you just have to wash the basket and tongs, so you don’t have a lot of clean up. They are tender and fall off the bone delicious. This is by far the easiest way to make them, and the recipe is almost foolproof. This is going to be one of those recipes, that you come back to and change it, but use the same directions. So, pin it, or print it, cause trust me, once you have these you will keep on making them. The time is amazing, you literally, spend almost no time basting them, they just make themselves, the only thing, I ask is that you flip them once and baste them once. The easiest ribs to work with is baby back ribs, but you can use spare ribs or country style. You might have to adjust the time for them because they are bigger ribs. 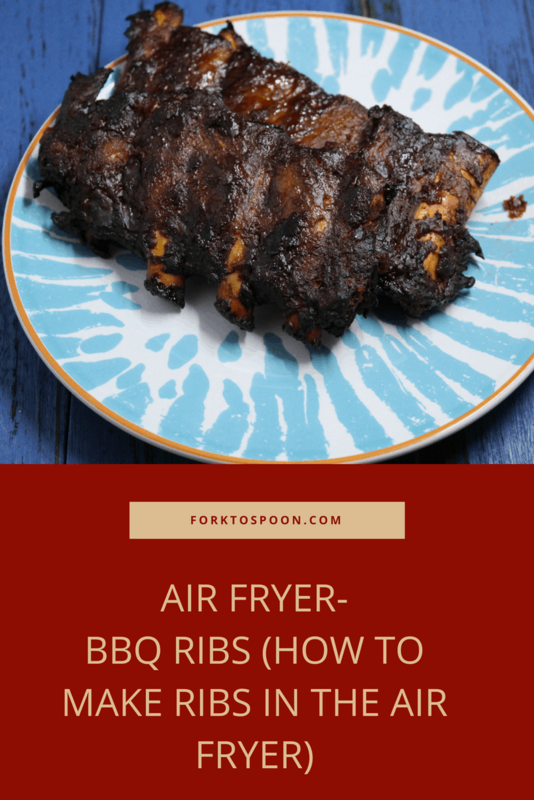 You can separate your ribs, in order for them to fit in your air fryer, since every air fryer is different, just cut them, to make them work in your air fryer. I used a paper towel to remove the membrane, which is the white tissue part on the back. It’s rather easy to remove, just use a knife and paper towel to remove it. I keep a huge batch of this stuff on hand. It’s one of my grandmother’s recipes, that I was lucky enough that she passed down. Anytime, I want to fire up the grill and BBQ, my rub is all mixed and ready to go. This is an amazing rub on Pulled Pork or Pulled Chicken. One of the best things about this rub is that it keeps the meat nice and tender since it creates a caramel sort of coating on top of the meat. Season the ribs with salt & pepper and other spices if you like. REmove the membrane. 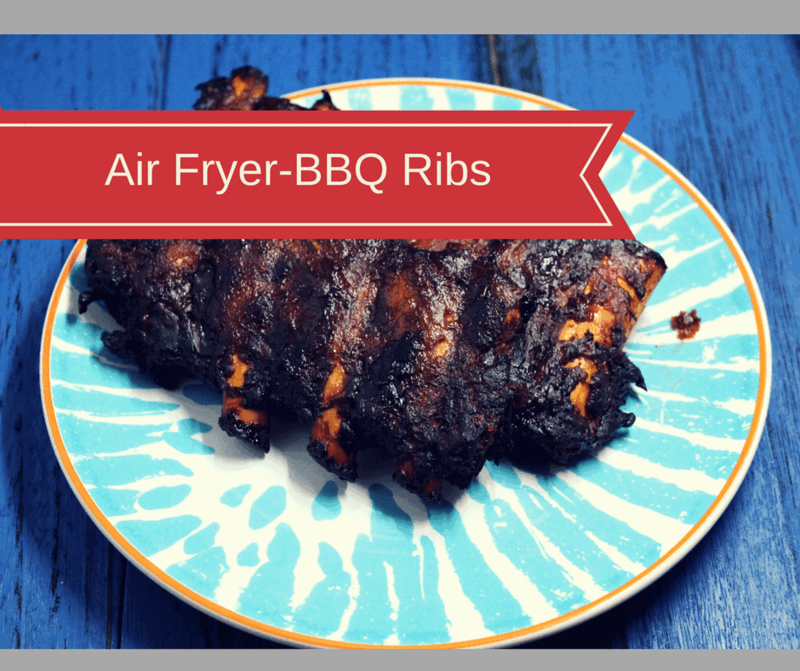 Smother your ribs with BBQ sauce and place them in your air fryer basket. Then set the time for 10 minutes, then flip them again for 7 minutes. Note: You should always use a thermometer for pork, eating raw pork can cause illness. 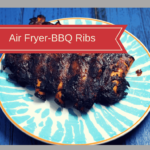 The exact time to cook your ribs depends on your air fryer, wattage, the thickness of the ribs, etc. Remove from air fryer, add some extra sauce if you wish, plate, serve & enjoy!